Description: Procumbent or erect shrub to 1 m high. 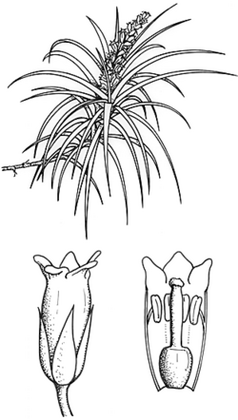 Leaves spreading, lanceolate, usually 5–14 cm long, 5–12 mm wide, apex long-acuminate, base broadly sheathing; margins entire or finely toothed. Flowers in narrow panicles 5–15 cm long, mostly secund; bracts brown, falling. Sepals ovate, 3–5 mm long, acuminate. Corolla white or pink; tube 5–8 mm long; lobes ovate, 1.5–2 mm long, erect or spreading. Anthers 1.5–2 mm long, enclosed in tube; filaments with upper 1 mm free, fused below. Nectary scales c. 2 mm long. Capsule c. 5 mm diam. Distribution and occurrence: Grows on sandstone rock ledges and wet cliff faces; coastal districts from Kendall to Pigeon House Mtn, and west to Blackheath. Flowers White or pink, tubular 5--8 mm long, July--December, peak September, continuing until December in Blue Mountains. Fruit/seed Capsule, 3--5 mm diam., with pale brown seeds less than 1 mm long, September--December, sporadic March--August (Brown & Streiber 1999). Dispersal, establishment and growth Diaspore: seed, probably wind-dispersed. Dispersed by gravity, water, wind (A. Bofeldt pers. comm.). Fire response Killed by high intensity fire (at Lane Cove River & Narrabeen Lake 1/1994), seedlings reported after fire (P. Kubiak pers. comm.). Interaction with other organisms Root association with Ascomycete and Basidiomycete micorrhizas, possibly seasonal (Allen et al. 1989). Habitat Lithophyte on sandstone rock ledges and wet cliff faces. Sometimes on clay banks and rarely on tree fern trunks (A. Bofeldt pers. comm.). Vegetation With sandstone scrub or other moist site species e.g. Bauera rubioides, Leucopogon lanceolatus, Epacris longiflora, Epacris crassifolia , Tristaniopsis collina, Banksia serrata; warm temperate rainforest on poorer soils, M. Robinson, A. Bofeldt pers. comm.). Substrate Sandstone rock ledges and wet cliff faces, very low-nutrient sites, moisture supply permanent. On very well-drained rocks or cliffs (A. Bofeldt pers. comm. ), also recorded on shale (Brown & Streiber 1999). Exposure Sheltered rock faces and ledges in gorges and valleys (Brown & Streiber 1999), deep--mid shade.